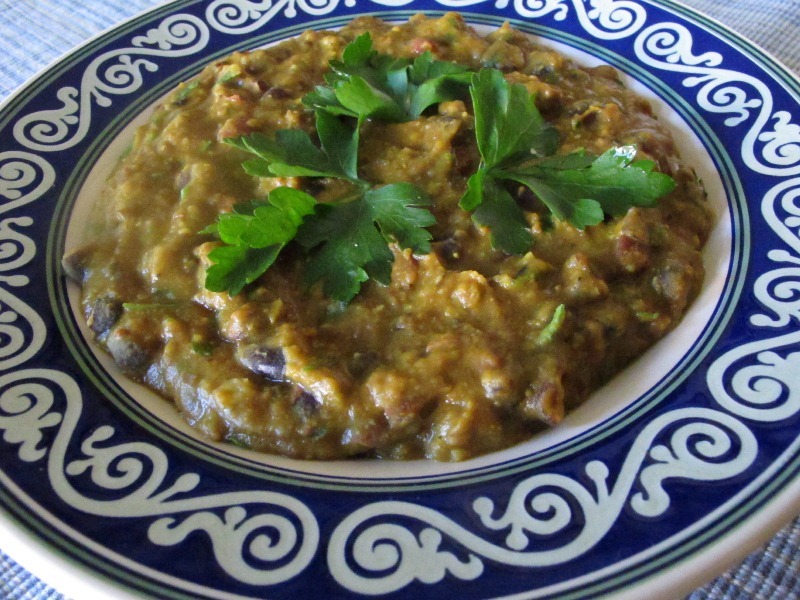 Ful medames, a staple dish of fava bean porridge in North Africa and the Levant, has many regional variants. In Egypt, it’s often served for breakfast, accompanied by flatbread and pickled vegetables. My version adds black and kidney beans and red lentils for a more varied nutritional profile, as well as turmeric and black pepper. Add as garnishes the ones suggested below or more olive oil, vinegar, mint, parsley, chopped garlic, berbere or other hot pepper, or other ingredients of your own choosing. Soak beans and lentils overnight in about 6 cups of water. The next day, check to see if all beans have fully plumped up and rehydrated; if not, soak for another day or so. Soaking not only greatly reduces cooking times but also leaches out phytates and enzyme inhibitors that can impair nutrient absorption. Add lemon zest and juice, garlic, spices, and olive oil and mix thoroughly to combine. Mix most of the chopped parsley into the ful, saving some to scatter on top as a garnish. Serve in bowls with optional garnishes and mix-ins. This entry was posted in Beans & Pulses, Breakfast and tagged black beans, fava beans, ful medames, gluten-free, kidney beans, red lentils, vegan. Bookmark the permalink.